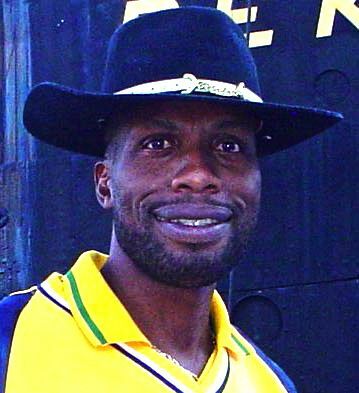 Sir Curtly Elconn Lynwall Ambrose is a former Cricketer who played for the West Indies, hailing from Antigua. He has played 98 Test matches for the West Indies squad. Born on 21 September 1963 in Swetes, Antigua, Ambrose came to cricket at a relatively late age compared to many other players. He is a Left-hand batsman and Right-arm fast bowler who took 405 wickets in his Test Career. Son of a carpenter, Ambrose became an apprentice carpenter at the age of 17. His mother who was a fan of cricket encouraged him to join the game. Having a height of 6ft 7 inches, he turned out to be an outstanding bowler. Ambrose made his ODI debut against Pakistan when Pakistan toured for West Indies in 1988. He made his debut in the first match of the series and took 4 wickets for 39 runs. He made his Test debut in the same year and tournament against Pakistan at Bourda on April 2, 1988. He took two wickets in his Test debut. In early 1990, England toured West Indies for a Test series where Ambrose performed remarkably well and took 8 wickets for 45 runs and was adjudged Man of the Match. In late 1990, West Indies toured Pakistan and he topped the bowling averages in his team. In a later series with England, he played remarkably well when he twice took five wickets in an innings and his best figures were six for 52 runs. He was adjudged the man of the match and man of the series for the West Indies side. After his retirement in 2000 after a series against England, he became a part of ICC hall of fame in 2011 for his outstanding career records. Ambrose was rated the world's best bowler in the ICC player rankings, first reaching the top in 1991. He was adjudged the Knight Commander which is an Antiguan and Barbudan order of chivalry in 2014.